Things That Just Xiss Me Off! Defend Corona Pastor and City Council Member from [Hamas linked] CAIR, [11/17, 6:30]. Prop 6, Repeal the Gas Tax Rallies in Corona [10/18, 6p], Victorville [10/19, 12p] and Palm Desert [10/19, 8a]. Sean Flynn, Meet and Greet at Le Rendez-Vous, Colton [10/19, 5-7p] and canvassing, Rancho Cucamonga [thru 11/3]. Travis Allen, Take Back California, BBQ Rally and Canvassing for Assembly Candidate Billy Essayli, Riverside [11/20, 12:30-6:00]. RTPP Canvassing [11/20], Redlands Market Night [11/18 and 25, 6-9p], and Texting Program. Redlands Tea Party Patriots’ Voter Guide. Ann Coulter and Alfonzo Rachel Reception, Dinner and Fundraiser for Tim Donnelly, Victorville [10/13, 6p (5p for VIP)]. See and support #GosnellMovie, The Trial of America’s Biggest Serial Killer. Trump @ War by Steve Bannon. America, the Dem Party and Daring to Do Our Duty: 1860 and 2018. Mass Legal and Illegal Immigration is an Existential Issue for the #MAGA Cause. 62M Immigrants and Their U.S.-Born Children Now Reside in America. Ivy League Study: Illegal Population is 22 Million, Double Estb. Estimate. “Occupied America.” Here is what is being “taught” in the #GovernmentRunSchools and who is “teaching” it. CA Schools Pushing Racist, LGBT, SJW Agenda on Children. Redlands Tea Party Patriots online. Our Special Thanks & Appreciation. 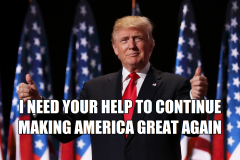 Yuuge Thank You(s) to our Amazing and Dedicated Patriots for Their Work in 2018. The Year in Review [with pictures].